Moving is always a pain. If you’re traveling vast distances, it’s a full on headache. You’ve got to have all of your stuff shipped, and pray that it all arrives undamaged. Luckily, there are reputable moving services and insurance for those that can afford it. But what about cargo that’s irreplaceable? What about your dog that’s too big to fit on the flight with you? You can treat your dog as a checked bag, but you’re taking a risk. 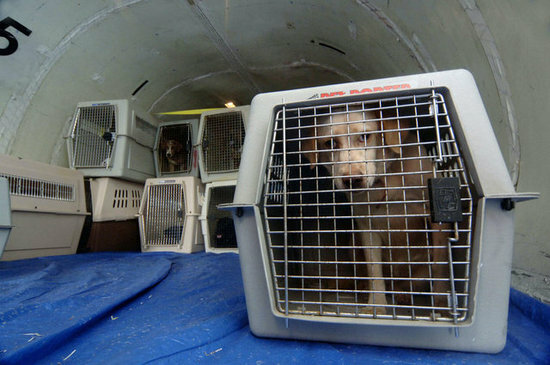 Since airlines have begun reporting the numbers in 2005 there hasn’t been a single airline that offers pet transportation in the cargo hold with a spotless record. In fact, from 2005 to 2012 there were 330 reports of missing, injured, or dead canines. Though this is a small number relative to the amount of pets that were actually shipped, (an amount that is unfortunately not reported) it’s not exactly an encouraging statistic. If at all possible, you should avoid shipping your pet via airline. There simply are no guarantees, especially with commercial flights. Though major airlines claim that pets are kept in climate controlled, pressurized, and “pet friendly” cargo area, the fact that there have been 38 cases of pets being lost while en route makes one doubt whether they are being treated as living creatures rather than glorified luggage. So you must be wondering, if major commercial airlines can’t be trusted, then who can? There are a few specialty services that offer pet relocation. These niche companies understand that people worry about their pets in stressful traveling situations, and as a result uphold rigorous standards in their caregiving. Companies like Pet Airways cater exclusively to pets, and have dedicated staff monitoring them throughout the flight. So there actually are no human passengers on the flights with the pets. This added level of safety and security makes a specific company like Pet airways your best pet shipping option. Other pet specific airlines include names like: Pet Relocation, Air Animal, and 4 Paws on Wheels. Before trusting your pet with any relocation service, it’s important to thoroughly vet the company and exhaustively research your options. So do your homework before making a final choice. Keep in mind again that it’s much better to avoid having your pet fly in the first place. Unless it is small enough to fit underneath the seat in front of you on the same flight, then you’d be much better served having the animal transported on the ground. Unfortunately, that’s not always an option when you’re traveling over water. So if you must ship your pet, be sure to prepare as much as possible. Underfeed the pet before boarding, this is to limit the possibilities of a distressed stomach and in-air accidents. Do not sedate your animal, this can have very negative health effects at high altitudes. And be sure to have your pet examined by a veterinarian before takeoff. If you can follow these and any other guidelines given to you by the company you employ, you maximize the chances for a positive traveling experience for you and your pet.